Captain Corelli I am not. I do, however, have a fondness for kitchen gadgets. Let’s just say if it slices or it dices, it entices. This is why I think Tara’s mom is so cool. She has both a miniature blowtorch and a set of battery-powered salt and pepper grinders that I oohed and ahhed over during my visit in October (an identical pair of the latter subsequently found their way beneath Tara’s tree on Christmas day, proving that Tracy actually paid attention to the attention I paid to (confused yet?) her gadgets. Hmm, maybe I’ll find a blowtorch stuffed in my stocking this year?! Dare to dream, Petruska). The point is, anything that is cool and handy and helps out around the kitchen makes my heart beat faster. This applies to both my girlfriend and inanimate objects. 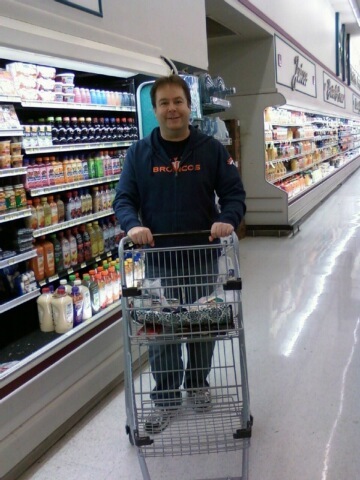 I found myself in Fred Meyer last week with a little extra cash and a mandoline that happened to be on sale. Ooh, I thought. I can’t believe I’ve survived all these years without one of those! And into my baby cart it went. Bread? Check. Milk? Check. Mandoline? Check. Sadly, the next few dinners I made did not call for any sliced ingredients. I was beginning to think my poor, lonely mandoline might be forever regulated to the Second Drawer Down, destined to gather dust, when I found a new casserole recipe that I wanted to try that called for, among other ingredients, sliced shallots. Be still my heart! It was time to bust out the mandoline!! I grabbed a shallot and commenced to slicin’. Everything was fine and good – I had perfectly uniform sliced shallots piling up in a neat little stack on the cutting board – until I nearly severed my thumb. In case you’re not familiar with a mandoline, it’s got a very sharp blade that slices through a myriad of vegetables – onions, carrots, potatoes, turnips – with ease. And also, I might add, human flesh. I didn’t even realize I’d cut myself at first. There was a sharp pain and my reflexes kicked in immediately. I examined my thumb and it wasn’t bleeding, so I figured it had been a close call and nothing more. But then it did turn red and, upon closer examination, I discovered a chunk of flesh missing. You know, being a fan of the cooking show Chopped, I have never been able to understand why it is that on nearly every episode somebody ends up cutting him- or herself. Is one of the mystery ingredients blood? But after my own close brush with a heinous cooking injury, let’s just say I’m a little more sympathetic to their plight. I get it now. Cooking is dangerous. It is not for the faint of heart. Maybe I’m exaggerating a little. “Chunk of flesh” might be a bit extreme. But there was a knick in my thumb, and it smarted a little. Fortunately, the casserole turned out delicious. All my wishes for snow, I’m happy to report, came true. Around 8:30 Tuesday night it began snowing, and was piling up nicely by the time I went to bed. By daybreak we had 3″ on the ground, and school was cancelled. Unfortunately, by daybreak it was already 40 degrees and raining. Alas, within a few hours all traces of snow had disappeared. It’s often like that around here; it rarely lasts more than a day or two. The high temperature yesterday reached 52. Our meager three-inch snowpack never stood a chance. But it was beautiful while it lasted, and winter isn’t over yet! Tara and I are approximately 12 hours away from seeing each other again. Woohoo! The thing that has made this long-distance relationship bearable is the frequency of visits we have made back and forth. We’ve never been apart too terribly long, despite fears to the contrary when we first started dating. Of course, I don’t think either of us expected our feelings toward each other to be so intense in the beginning, either. We are both very anxious for Tara to move here, and looking forward to starting that chapter of our lives together. In the meantime, we’ll keep enjoying these little get togethers. The last time she was here, I ended up in the hospital while she was stuck in my house by herself for three nights. We definitely hope to make up for that this time around. We’ll have a day to ourselves, a day spent adventuring with the kids, a birthday dinner for my dad, and then on Sunday we fly out together to Vegas. We’re not staying there this time – our destination instead is lovely Pahrump, Nevada – but it’ll be fun regardless. We wanted to take advantage of some work she had to do down south by spending a couple of extra days together. Translation: free hotel room. Hey, a bargain is a bargain. I fly back Tuesday night, so it won’t be a long trip to Nevada this time, but even a couple of days will be worth it. Then, we’ll reset the countdown clock to our next visit, in February. I bought a mandolin from Pampered Chef many years ago, and promptly misplaced the gadget that potentially saves one’s fingers or knuckles. 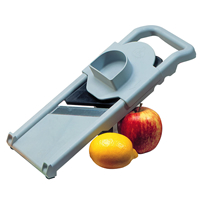 I love using it for slicing, but, like you, I’ve almost lost a finger by not using the guard (and the guard doesn’t work very well even when you DO use it). Still, I love the mandolin. Even more, I love my chopper. I use that almost every day. Do you have one of those? I don’t have a chopper, but perhaps more concerning, my mandoline did not come with a guard. Hmm…no wonder it was so cheap! The guard looks like a paddle with three prongs on it that you’re supposed to stab whatever you’re slicing. But it doesn’t work well with, say, carrots, because you want to chop carrots width-wise and not length-wise. So, you have to resort to knowing when to stop before chopping your fingertips. You’ve GOT to get a chopper!!!! I’ve had the Pampered Chef one for like 12 years, and it’s still in perfect shape. Downside to that is I think you still have to order it from someone who sells Pampered Chef. Regardless …. you’ll use a chopper all the time. Oh! Never mind, then…I do have a guard. But I, umm, removed it because I couldn’t get it to stick into the top of the shallot very well. Oops. Somehow I knew the mandoline story would have a bloody ending. OUCH! Also, thought about you this morning when I heard about your snow on the news. Lucky! You’ve now had more snow than us! Have a great trip, my friend. With me, stories usually do end that way. I thought for sure you were going to turn this into another slipping-while-crossing-a-mossy-creek joke, Mike. Glad to see otherwise. Oh yes…I am a kitchen gadget you know what. WOW!!! Thanks for all the shout-outs Mark!! I’m smiling ear-to-ear!! With Christmas only being a little over 11 months away, you may get that awesome stocking-stuffer after all. 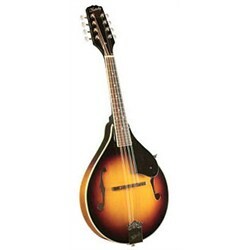 While I was out shopping for this past Christmas, I happened upon a mandolin that was on sale too. Well, with it being on sale, I couldn’t very well pass it up so into my cart it went. I’m thinking that when you and Tara come up, I may be able to finally make something in which I can finally use it. For now, it’s being kept safe in it’s own box. We still have snow…and freezing rain on top of that! Have fun this weekend. Give my daughter a big ol’ hug for me!! You’ve got your very own mandoline, too? I’m not surprised. If anything, I figured you would have already had one by now. Can’t wait to see what you whip up for us when we visit next month! Enjoy your snow (but you can keep the ice). Hope you keep your power and stay warm. Mark, I laughed so hard at your opening line when I read this…. And the reason being is that when I first moved back to Philly, I got a part-time job at a Williams-Sonoma (yeah, I know….me, the man who knows NOTHING about cooking) and the first time a customer asked me if we carried mandoline’s…well…I was totally confused because I actually thought they were referring to the musical instrument – I kid you not! Hey, I’m sooooo happy to hear that you DID get some snow. And WOW…3 inches! Unfortunately, we haven’t gotten ANY here. Although, I did hear that Saturday might bring some. Have a WONDERFUL time on trip, buddy! I cut myself in the kitchen about a week ago when I was using a chef’s knife like a paring knife. I hate that moment after I cut myself right before the blood comes – I’m always in denial before the blood – like maybe I didn’t really cut myself. I also hate it when I accidentally chop or grate part of a fingernail into whatever I’m doing. So far, though, I’ve never noticed fingernail in my food (at least not in the part that I ate). I’m hoping like crazy that missing chunk of flesh didn’t end up in the casserole, Patti. I suppose even if it did, we can just call it protein and move on. My mandolin would have a blood story at the end because I am just that absent-minded and clumsy! I hope you have a fantastic time with Tara and a really great trip! STAY AWAY FROM KITCHEN GADGETS. Of course I didn’t buy bologna, Jess. I told you – I have mine imported from Trenton, New Jersey!! See? This is why I stick with microwaving frozen waffles. No risk of injury (or over exerting myself!) 🙂 Hope you & Tara have super much fun! Not to be a stickler for details, but doesn’t microwaving frozen waffles make them soggy? I stick to the toaster when I do mine. The guard is your friend! Or at least just be VERY careful when going guardless. I love it for onions and potatoes! Cukes are very satisfying, too. Have fun… with all!!! Ooh…I hadn’t thought about cucumbers. And I have one in the fridge. Good call!